On the day John Bond was appointed as Burnley manager he revealed that his first signing would be one of his old Manchester City players Tommy Hutchison. I'd been quite excited at the news of a manager from outside the club taking over but the potential Hutchison signing didn't really do it for me. By the time the new season was about to start he would be just a month or so short of his 36th birthday. Back in 1983 signing a player of that age was just about unthinkable and I wondered what on earth could be in Bond's mind to even consider bringing him in. Don't get me wrong, Hutchison had been a good player, a very good player in fact. He'd started his career back home with Alloa but in February 1968 he was signed by Blackpool, then in the second division. They won promotion in his second full season at Bloomfield Road and so he came up against the Clarets for the first time in the 1970/71 season, a season that would see us both relegated. He'd been likened to Steve Kindon who was on our left wing at the time, but they were certainly very different players, although both of them could definitely be said to have some pace. In 1972 he returned to the top flight when Coventry signed him, giving Blackpool £140,000 plus Billy Rafferty for his services, and that begun a nine year stay at Coventry. Such was his form that he was recently voted their best ever first division player. Over the years he became a much better player and his use of the ball just continued to improve. He was one of the best crossers of a ball in the game and allied to his pace meant he was a difficult opponent for any right back. He won full international honours for Scotland and was in their 1974 World Cup squad in West Germany but was strangely omitted from Ally McLeod's squad in 1978 that went to Argentina. 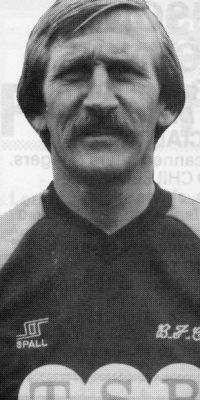 Hutchison though remained a top player for Coventry and one particularly good performance against Norwich helped map out the rest of his career. He'd tormented Kevin Bond, the manager's son, and it persuaded Bond's dad John to sign him when he first took over at Manchester City. He'd spent nine years with Coventry, during which time he'd also enjoyed a short loan with Seattle Sounders. He was in the side that reached the centenary FA Cup Final and he had the distinction of scoring for both sides as City and Spurs fought out a draw in the first game before Spurs won a dramatic replay. After a year at Maine Road he joined Bulova in Hong Kong, and it was from there that Bond signed him again, this time for Burnley. The new manager upset the fans even before a ball had been kicked by appointing Hutchison as his captain, thus removing crowd favourite Martin Dobson from the role. I'm sure that's the reason why some fans always seemed to have a downer on Hutchison although heaven knows why they should given his performances for us. It didn't take me long to realise that here was a player, despite his age, that was nowhere near the end of his career. In two seasons with the Clarets he never missed a game and turned in a string of top performances. He won the fans over too, and in his second season won the player of the year award in a season that had proved to be one of our worst as we were relegated to the fourth division under John Benson. Hutchison was now a popular player and when Benson, hardly surprisingly, was relieved of his duties, it was common knowledge that Tommy Hutchison was to be appointed as the club's first player/manager. At a dinner to celebrate the 25th anniversary of lifting the First Division Championship he was present as manager elect. So it was something of a shock when, out of the blue, Martin Buchan was appointed. The former Manchester United and Scotland defender offered Hutchison the assistant manager's job but he turned it down and re-signed for Bond at Swansea. Did I saw I wasn't so sure of signing him when he was close to his 36th birthday? Well, I was certainly disappointed that, at close to 38, he was leaving. Incredibly he played for Swansea for another six years, even enjoying a short loan return to Blackpool in the 1987/88 season. He also had a six month spell as manger when the club was declared bankrupt. At the age of 42 he became the oldest player to play in a European tie and he made his last appearance for Swansea at the age of 43 years, 5 months and 19 days against Southend. Even that wasn't the end and he played on in non-league for Merthyr Tydfil for three years before finally calling it a day at the age of 46. He continued with Merthyr Tydfil as their Football in the Community Officer and is still in the game today as a football development officer with Bristol City. In that long career he played exactly 800 league games in the Football League, plus those in Scotland, America and Hong Kong. Of those 92 of them were for Burnley. Tommy Hutchison proved to be a very good signing for Burnley and when watching him you always wished he'd signed for us years earlier. During that spell in the Bond season when we were hitting teams for fives and sevens his link up play with Kevin Reeves was a major part of it. Had we not messed him around in the summer of 1985 he would have still been a part of the Burnley side that first had to play fourth division football, and I'm damn sure we would have made a better fist of it with him than we did without him.